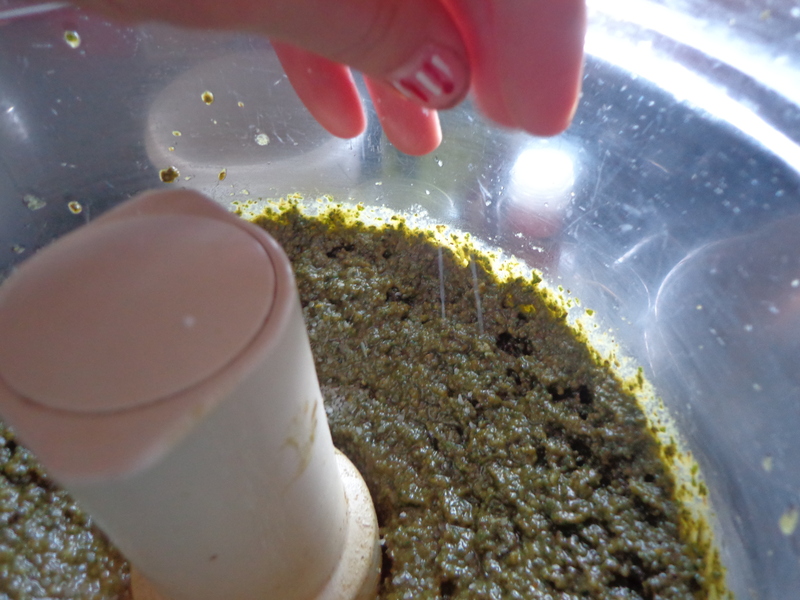 With an abundance of basil – and no tomatoes ripe yet to go with it – it was time to get started putting pesto in the freezer! 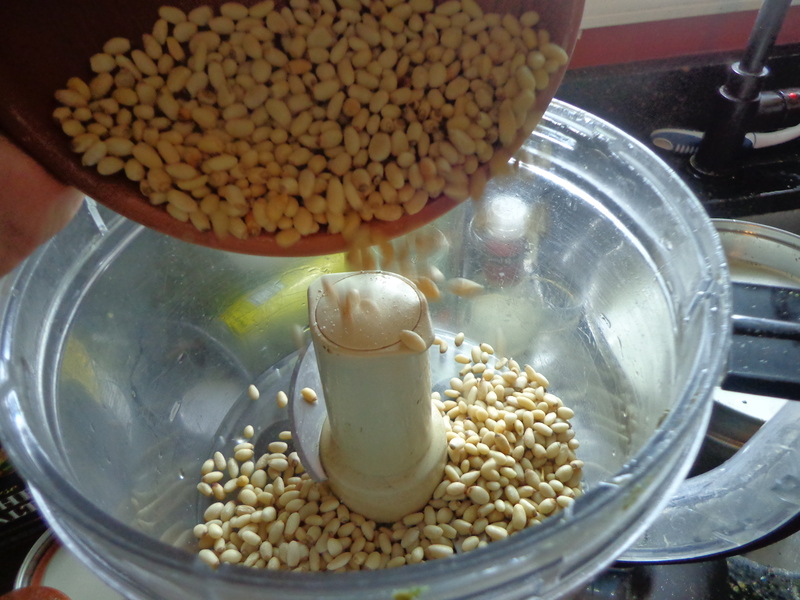 It’s really not at all difficult to make on your own – whether you use the old country way of a mortar and pestle – or the fanciest danciest food processor! This year we had fun planting two varieties of basil – purple and green. Whereas it is kinda cool to see purple leaves in the garden and they might make a pretty and unique garnish, it still makes pesto that turns dark green in the end – and the plants are not nearly as vigorous and high producing as the standard green basil. 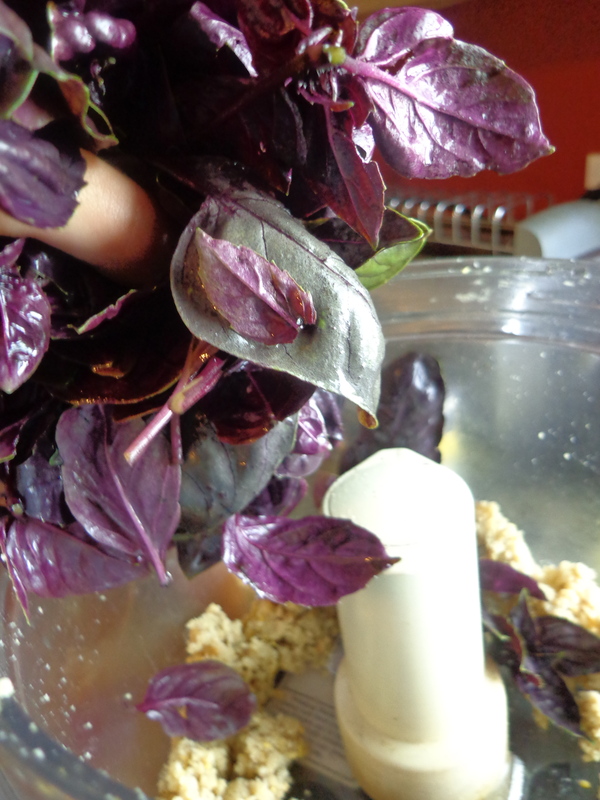 But we had to experiment, so we made a separate batch with just purple basil. Here’s the ingredients you’ll be needing. 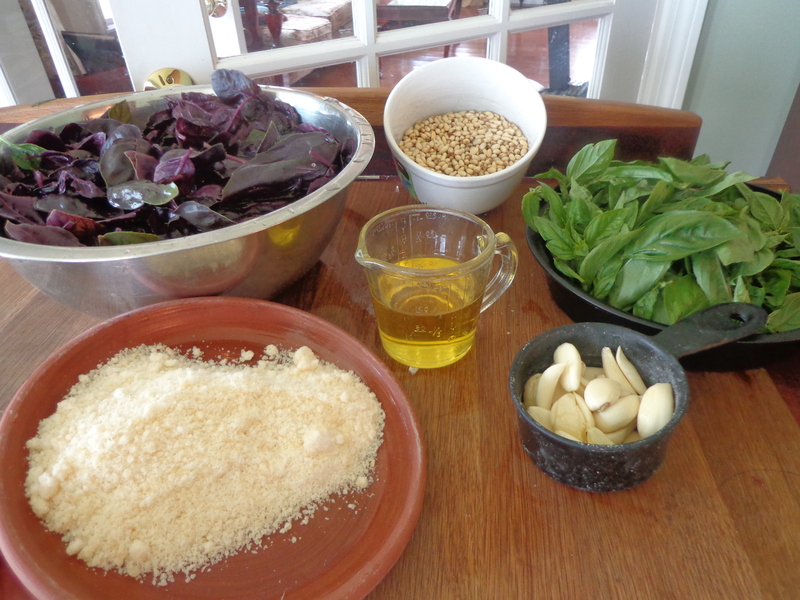 Basil, olive oil, garlic, pine nuts (or walnuts), parmesan cheese, and salt. Pretty simple! Next add the garlic. 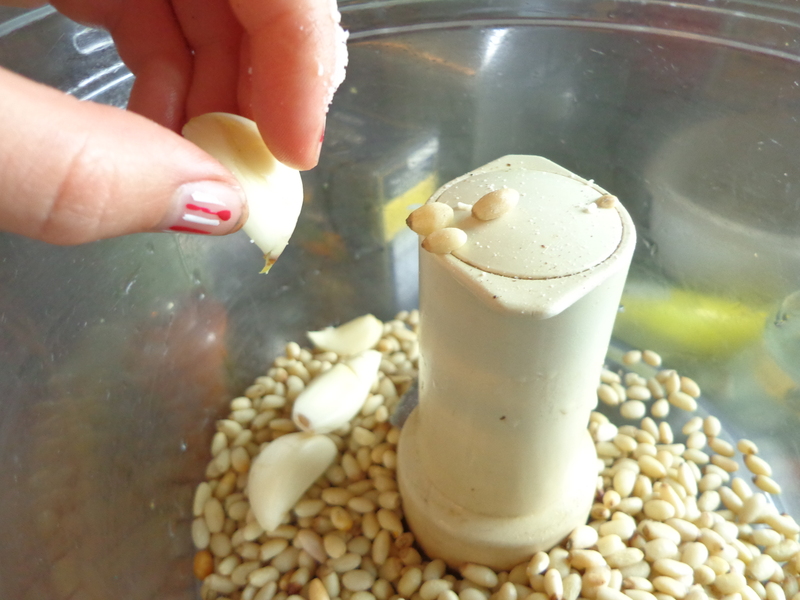 The recipe calls for 4 cloves, but you can use more if you really like garlic! Love my daughter’s Fourth of July fingernail?! 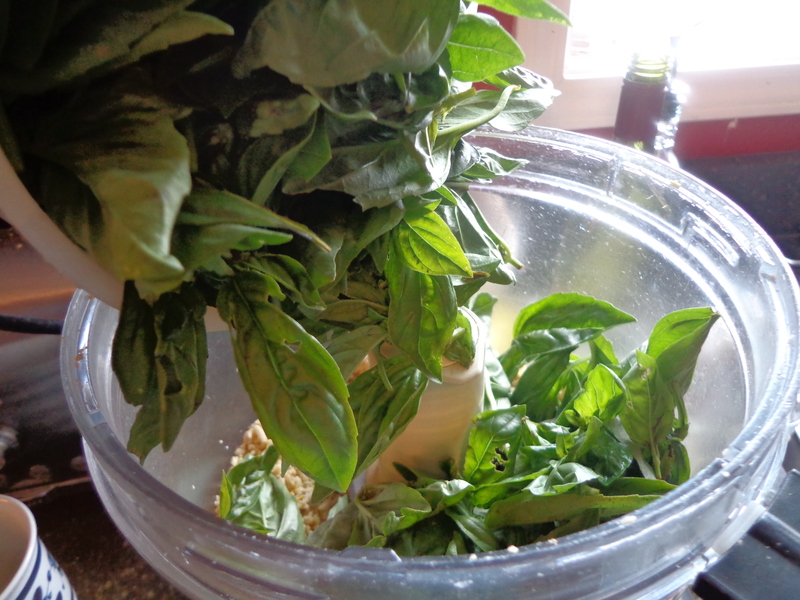 Give the nuts and garlic a quick chop in the food processor, and then add the basil. This is four cups very tightly packed. You may have to add it a bit at a time and process to make room for more in the processor. 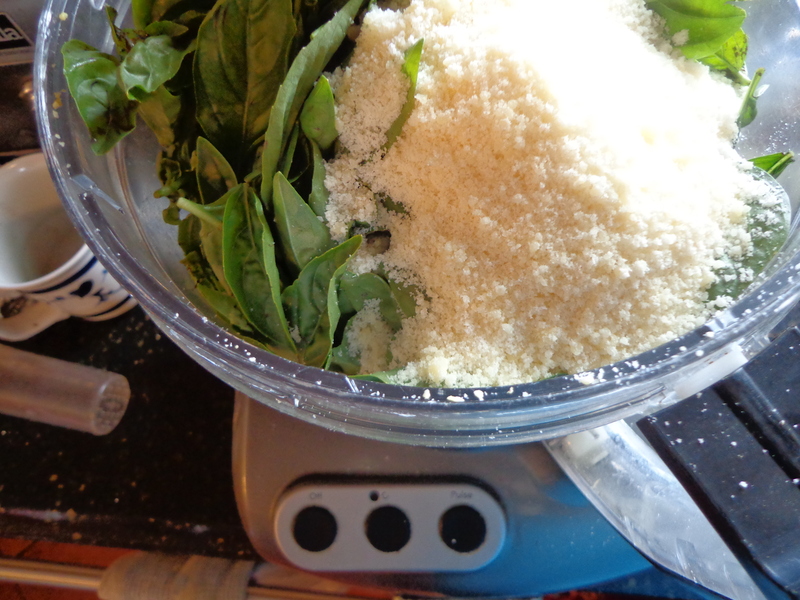 Throw in 1 1/2 cups of freshly grated parmesan cheese. We don’t use that canned stuff around here! Parmigiano reggiano is the best! Pecorino romano also works. And blend it until it’s all about this consistency. 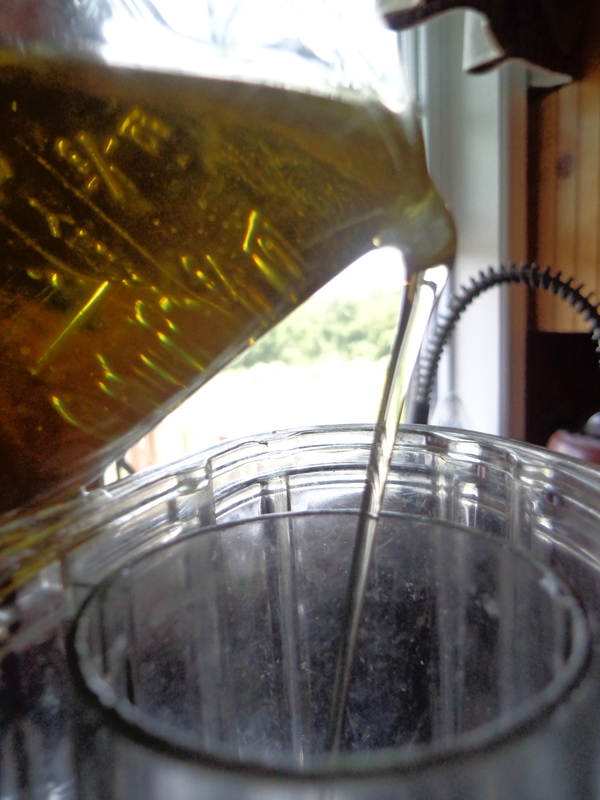 Slowly drizzle in 1 to 1 1/2 cups of olive oil (extra virgin, regular, or a mixture of both) until the pesto is the consistency you like. Add salt to taste. 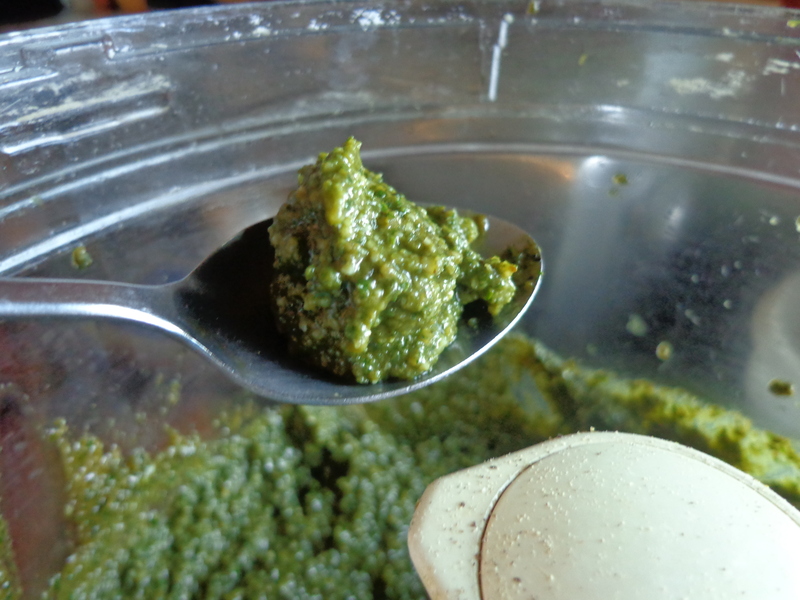 For one batch of pesto you will probably use 1 to 2 tablespoons of Kosher salt. Then it’s ready to put in jars, label, and freeze. 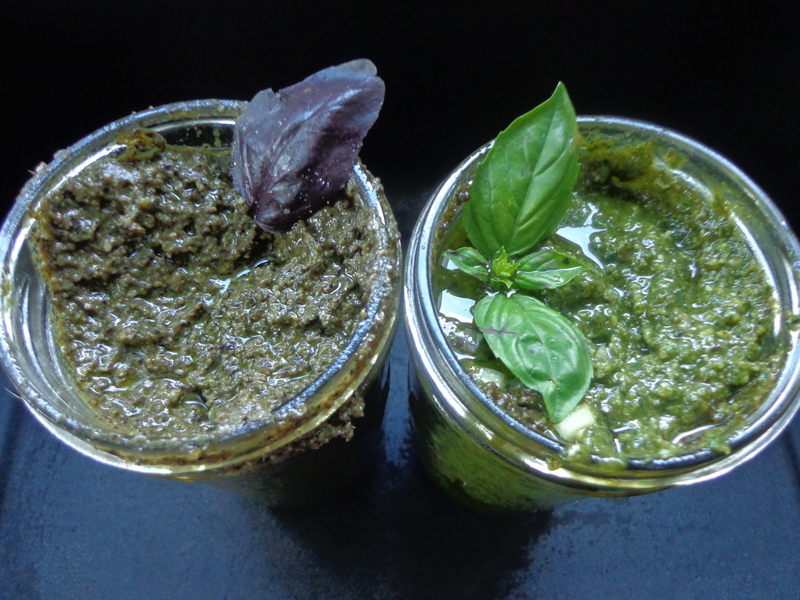 Here is the comparison of the purple and green basil. The purple pesto isn’t really purple it’s just more of a dark green. Pesto is so versatile! It can stand alone as a pasta sauce – makes a great sauce for baked chicken breasts or fish- use in marinades and salad dressings – flavor sauces – anywhere you want cheese, basil and garlic! Enjoy! Welcome home, Matilda the Magnificent! A couple of years ago we sold our beloved Matilda to a wonderful shepherdess in Massachusetts who was hoping to get into dairying – making yogurts and cheeses from sheep milk. Enter Matilda. Matilda has the udder of a cow – I kid you not! For those of you who have been with us throughout the years, Matilda was the first ewe to lamb at Morning Star Meadows. Her lamb, Daisy, was stolen by Molly, and we had to spend 3 days grafting Daisy back to her mother. Matilda always had extra milk for any lambs who might need a top up. I thought she would be the perfect ewe for this new shepherdess. 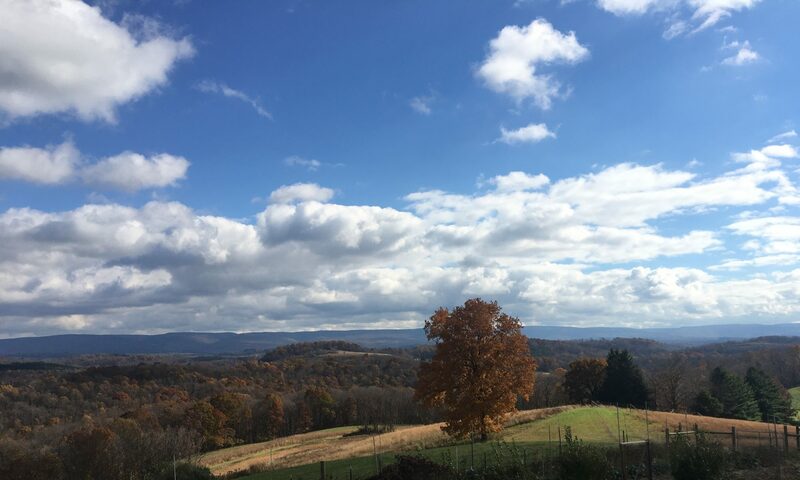 After nearly 2 years away from CT, Matilda returned on Sunday. And the consensus is – she remembers us! This was the following day – I thought I’d go and try to get some photos of her – but every time she caught sight of me she came running over for more love! So most of my photos were blurry action shots or ultra close ups as she checked out my camera! I’m not complaining, though. We’re so happy to have her back in our flock. 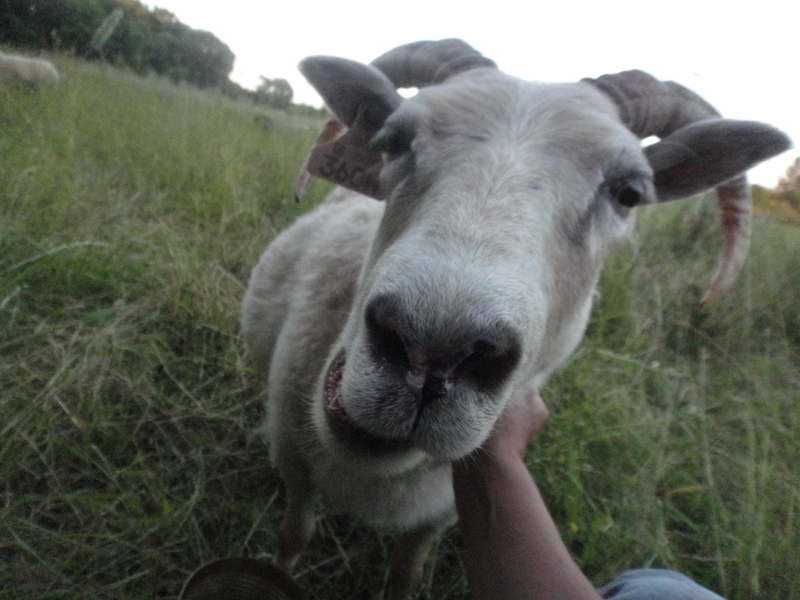 She settled in right away and actually led the flock into the handling pen this evening, as if she had never left us! She’s our homecoming queen and we’re quite pleased she’s back home!